Democracy and Climate Change explores the various ways in which democratic principles can lead governments to respond differently to climate change. The election cycle can lead to short-termism, which often appears to be at odds with the long-term nature of climate change, with its latency between cause and effect. However, it is clear that some democracies deal with climate change better than others, and this book demonstrates that overall stronger democratic qualities tend to correlate with improved climate performance. 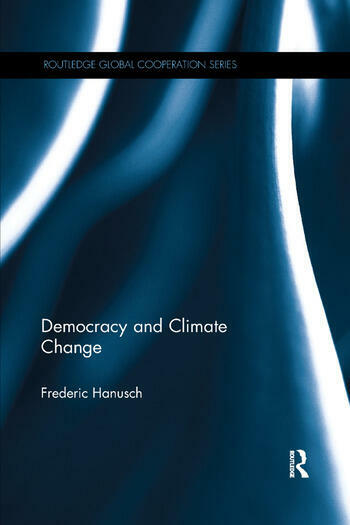 Beginning by outlining a general concept of democratic efficacy, the book provides an empirical analysis of the influence of the quality of democracy on climate change performance across dozens of countries. The specific case study of Canada’s Kyoto Protocol process is then used to explain the mechanisms of democratic influence in depth. The wide-ranging research presented in the book opens up several new and exciting avenues of enquiry and will be of considerable interest to researchers with an interest in comparative politics, democracy studies and environmental policies. Frederic Hanusch is a postdoctoral researcher at the Institute for Advanced Sustainability Studies (IASS), Potsdam, Germany.